Boltless rivet shelving offers an efficient, flexible, and durable storage solution that is easy to assemble. As the name indicates, there are no bolts, nuts, clips, fasteners, or other special equipment required to assemble these shelving units. Instead of struggling with assembly, you can set up these shelves and have them ready to use in a fraction of the time. And since the boltless design requires fewer parts, they don’t cost as much to ship. Furthermore, the shelving’s increased flexibility from its rivet tabs allows you to modify its configuration to your specific needs. The lack of additional parts (such as sway braces) also makes the shelves accessible from all sides. 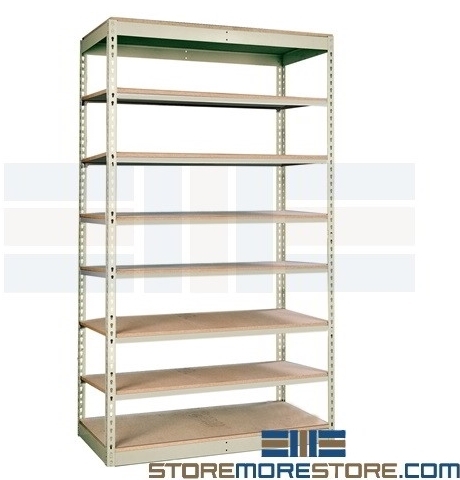 Especially for heavy-duty, industrial, or bulk storage applications, you need shelves that can handle the weight. The boltless shelving is available with optional particleboard or wire decking to provide extra durability and long-lasting use. You can also provide your own decking. Each unit includes four 1 ½” x 1 ½” angle upright posts (84″ high) made from 14-gauge cold rolled steel. Posts can be cut down or ordered shorter. Top and bottom shelves/beams use double rivet left-to-right and front-to-back beams, providing full perimeter support and stability. Intermediate shelf/beam includes two front-to-back side shelf supports. Other shelves include left-to-right beams only. 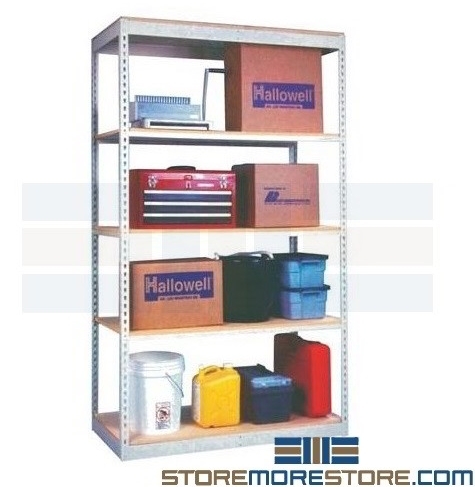 30″ and 36″ deep shelving units include front-to-back side shelf supports in every level. Load capacity for 36″ wide shelves: 350 lbs. per shelf level. 48″ wide shelves have a capacity of 250 lbs. per shelf level. Load capacities are based on evenly distributed weight across the shelves. Shelving comes standard without decking. Indicated units have optional wire or particleboard decking available. Available with 5, 6, 7, and 8 shelves. For actual unit dimensions, add ½” to the width and depth of all units (ex: a 36″ wide unit’s actual measurement is 36 ½”; a 24″ deep unit’s actual measurement is 24 ½”). Easily assembled with a rubber mallet. Boltless rivet shelving is available to buy online and ships unassembled with easy assembly instructions. If you need further assistance, give us a call at 1-855-786-7667 and one of our storage experts will help answer all of your questions.